Robert Mitchum from the trailer for the film The Sundowners. 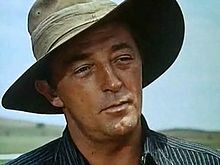 Robert Charles Durman Mitchum (August 6, 1917 – July 1, 1997) was an American film actor, author, composer, and singer. For a while it looked like I was going to be stuck in westerns. I figured out I could make 6 a year for 60 years and then retire. I decided I didn't want it. So I started blinking my eyes every time a gun went off in the scenes. That got me out of westerns. She may have been right. Looking back, I suppose I was expecting, as a young actor, to discuss Stanislavski or 'Acting as an art.' Instead, I palled around with the crew—the grips, the stagehands—and the conversation centered around the two B's—broads and booze. I usually take no notice of reviews unless a critic has thought up some new way of describing me. That old one about the way I sleep my way through pictures is so hackneyed now. As quoted in "Kate and Deborah Disagree"
No. But it was indicated by other people that I should go there—like my wife, my friends, the woman from Alcoholics Anonymous who came around. My wife, Dottie, was the prime mover. It would have been a disappointment to her if I'd rejected her suggestion. I stayed until they were done with me. I don't know if it 'worked.' I don't understand that. Listen, when I arrived in Los Angeles in the early '40s, there were just 640,000 people. Every loser in the world headed there because there was no competition. The keynote was mediocrity because the film, radio and music businesses had defined that the average mental age of the audience was 12. They handed me the bloodstained hat of a guy who'd fallen off his horse and suddenly I was in the movies—in a Hopalong Cassidy picture. I give hope to the hopeless. People say, "If he can make it, I can be Queen of England. Yeah, I'm unique—like an actor who has only one eye in the middle of his forehead. Or the Elephant Man. I've got a patent on the type. To be an actor is to be a moveable freak. Once you have been up there on that giant screen, everybody knows you—and you know no one. It counts as a source of embarrassment. Got the same attitude I had when I started. Haven't changed anything but my underwear. I've played everything except midgets and women. People can't make up their minds whether I'm the greatest actor in the world - or the worst. Matter of fact, neither can I. It's been said I underplay so much, I could have stayed home. But I must be good at my job. Or they wouldn't haul me around the world at these prices. Hey, I get enough exercise; I breathe in and I breathe out. You know you can't act, and if you hadn't been good-looking you never would've gotten a picture. As an actor he is superb. However you read a line, he has anticipated it. He is a fantastically sensitive, decent human being. Deep down he is a gentle, obliquely witty man, possessed of many, many more talents than the acting by which he is known. This page was last edited on 28 February 2019, at 23:31.